An Act of Heresy by Chris Betcher is licensed under a Creative Commons Attribution-ShareAlike 4.0 International License. The frenzy of hashtagged tweets coming at me is more like spam than meaningful conversation or anything close to enlightenment. A hundred people agreeing with each other doesn’t enrich my world. Any benefit I get from a hashtag may well be after the ‘event’ where I can take the time to read and connect #gtasyd or #slide2learn tick along quite nicely without the tsunami of the event. Agree on hashtag chat Chris…but also agree with Allanah – it is a good curating tool. I don’t participate in the chats but can be known to search using a hashtag to see the gist of things. Also agree on teachmeet style presentations….limiting to 2 or 3 speakers, giving them moretime and then having an open floor conversation and networking time works much better for me. No matches in my pocket! It’s the contrived use of hashtags to have time limited “chats” that I can’t warm to. This feels unnatural and confusing to me. Thanks for not having any matches in your pocket! I’m actually encouraged by the positive responses I’ve received here… good to know it’s not only me that feels this way. PS: Those with long memories will recall that Twitter was originally released without a search function, and did not have search for a long time. It was a third party tool that Twitter eventually bought (can’t think of it’s name now)… hard to imagine a Twitter that was not searchable! For me the pull of Twitter has subsided a little (took a little over 12 months). I tend to agree with you regarding the scheduled chats. Of late I much prefer to engage in conversation with someone who posts an article, a comment or a blog (as you have done)……and it’s even more fun if others eventually join in. I like Twitter to be like this because it mirrors a natural conversation, where someone brings up an idea and you can contribute or not. Much like a real staffroom where casual professional conversations can occur over lunch or a coffee. My pet hate with regard to the hashtag chats is those that are promoted ceaselessly. I have unfollowed a few who fill my feed with continuous advertisements for their chats. While I enjoy ‘meeting’ educators from across the globe on Twitter, I will resist swelling the ranks of those chat hosts/hostesses whom focus on getting as many participants as possible (do they equate this with success?) Being connected is fabulous, but I have learned to be discerning. My favourite people on Twitter are those who throw out an idea, share something they have found interesting or make a contentious statement and then wait for a response. Very engaging. Thanks Alison! Interesting to hear your thoughts about the subsiding “pull” of Twitter… I feel the same way. I remember back in the mid 2000s when blogging came onto the scene in a big way, and regular people found their “voice” online. It was a revolutionary moment in time as so many regular, non-techie people found that they suddenly owned their own printing press and could share with a global audience, all this a low barrier to entry. Now, we almost have too many avenues for sharing… between Twitter, Facebook, LInkedIn, Google+, Pinterest, and so on, we are all now posting constantly, sharing constantly and as you have seen, promoting constantly. It’s a bit of a glut! I still love Twitter a lot, but I would never want to lose the option to blog in a longform way, write as much or as little as I want, however I want. I’m not a big fan of the Facebook for many reasons, and as the novelty of Twitter subsides I find the limitations of the platform more and more tedious. For me, Google+ has emerged as my social platform of choice because of the way it allows people to gather around ideas rather than personalities, and to them engage in meaningful archivable, searchable, threaded conversations. It’s a much better place to actually converse. I can’t help think that these hashtagged chats on Twitter would be far more effective on G+, as people could still contribute but in a more flexible, grokable format. But that’s just my own opinion. Thanks for your comments and it’s been encouraging to hear from so many people that I’m not on my own on this thought. Thank you for giving me the word “grokable”. Interesting points indeed Chris. I have to say I agree with your thoughts about Twitter however hashtags seem to work for those who use them and if it engages teachers in conversations about best practice, who are we to complain. Two weeks ago I recommended Twitter to a new scheme teacher, I caught up with her last week and she was buzzing with its discovery. For a new teacher to Twitter, hashtag conversations can be a way of curating the random conversations that can seem to clog it up these days. As to TeachMeets there is no right or wrong way to hold one. Last week TM Manly had six presenters, who each spoke for between 3 and 10 minutes, those amounts interspersed with conversations and networking took two and a half hours, which was a perfect time frame. Some people prefer to be specificly structured, so what? Just to clarify, it’s not hashtags themselves that bother me…hashtags are critically important to the value of Twitter and are the way that ideas are aggregated together across the Twitter network and for communities to form around those ideas. Hashtags are vital. My concern was with the use of hashtags for these brief, ephemeral “#chats” that typically take place at a specific time. For an hour or so people flood the timeline with disjointed tweets that have little in common except a hashtag. There is typically little by way of actual conversation, in that everyone is speaking and hardly anyone is listening. A question goes out, a flood of truncated responses come back, there is rarely any responses to the responses, (there isn’t time) and the majority of responses are usually shallow and trivial (there isn’t space). After an hour, all you’re usually left with is an echo chamber of people agreeing with each other, high fiving each other with retweets, and all with very little actual content or pushing of thinking. I see this as a VERY different situation to a hashtag that is not time dependent and that just exists for continual aggregation purposes. Hashtags seem to work wonderfully for aggregating tweets around a theme, but not so well for aggregating around a conversation. As always, these are just my opinions and may be completely at odds with what others think. And I’m fine with that. As for Teachmeets, while there may be no right or wrong way to hold one, every Teachmeet I’ve have ever attended uses this format, so it’s all I’ve ever experienced. I certainly think there is a place for the short, sharp demo-style sessions for idea sharing, but I don’t get much value out of spending a couple of hours where this is the ONLY format. For me, it just feels like it’s trivialising ideas by distilling them down to an app, and extension, or a web 2 tool. Maybe I just need to get to more Teachmeets to try to find one with a different format. Henrietta, you are well respected for your work, and involvement in Teachmeet. That said, there are other people who believe they “own” teachmeet, and have the right to tell others how to run things. I don’t support the teachmeet format, as I feel conversations should be centre stage. Teachmeet was never designed to be an “all about me” affair, but in some places in Australia, that is what it has become. A pity really. Thank you for all that you do to support teacher professional learning in Australia. It is deeply appreciated. Like Chris, how you model your practice, lifelong learning, and collaborate with others is what helps me learn. Chris, From the very start I had a sense that Twitter was for those who wanted the 3 second ‘sound byte’ (as it used to be called). All very titillating and shallow and gave the participant a false sense of participation. In fact I had difficulty respecting colleagues who used this form “communication”. At least your blog took longer than 3 seconds to read. It also has a ‘humane’ ring to it. Unfortunately BOSTES don’t recognise the conversations held in the pub towards accreditation. The last surviving precious moments are now dedicated to the BOSTES tick box. Thanks though for your illumination. Thanks for your comment and the feedback on my blog. I’m glad it comes across as human(e), because that’s certainly what I try to be. I’m not dissing Twitter per se… I still like Twitter a lot, but I find it frustrating when it gets twisted into being something it’s not designed to be, and that’s a conversation platform for meaningful, thoughtful , ongoing discussion. It does that fairly badly. For other things it’s awesome. At the end of the day though, there are no right or wrong rules to how people use it. If this format works for some, then good for them. I’m just saying it doesn’t work for me, and by the look of the comments here so far, I’m not alone. Hi Chris, great to catch up with you today at ACEC and chat. I think I can really relate to the “cranky old man” feeling and your post here really resonates with me on a number of levels. I find Twitter to be alluring and frustrating – sometimes at the same time – and people are free to use the tool as they see fit. I’m apt to leave it completely alone for weeks on end and dip in when I see something interesting or when I want to connect with a specific individual. I can’t say that I’ve even tried to participate in one of the hashtag events as I find it difficult to pull the threads together in a coherent manner. There are some topics and ideas that only a well written post somewhere can do justice to. 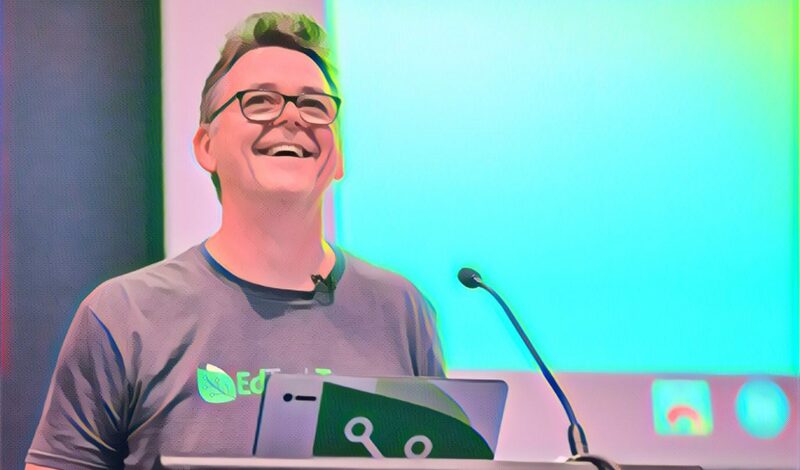 As for TeachMeets, the format as you have experienced does seem to go against the participatory intent of the original concept (or at least from what I read from people like Ewan McIntosh). I remember going to a TALO Swapmeet back in 2007 put together by Leigh Blackall, Alex Hayes, Michael Coghlan and Stephan Ridgeway which was my style of learning – no preset agenda, bouncing from one idea to another, Alex trying to connect in other people like Nancy White using Adobe Connect, some topics misfiring and being abandoned and others getting extended buy in because the group got keen on the ideas being explored. Maybe, it’s a bit of the blog vs Twitter mindset – the blog being the place where you write for as much as you want on whatever you want and the comments flow out, while Twitter seeks to set limits, organisation and structure – more in line with the Teachmeets you describe. And sometimes, people just follow the crowd because it’s where they think the cool kids hang out. Me, I was always a bit of a loner and a heretic, anyway. Oh, the heresy! A great blog post, for which I love your honesty. The comments are all so well thought out that they’re a credit to the blogging format. That being said, I disagree with you. Shock, horror, I know; I’m not impartial as I run one of the one hour #chats. Here’s my thoughts anyway. I see twitter #edchats as an important part of the current ecosystem. They’re an ‘in’ for people to discuss topics that are new to them or that they don’t get to discuss with people like those in the edchat. For instance, teachers who are already implementing ideas from the topic, researchers, new and experienced educators. It’s one hour in 168; although not great for deep thought, this might be a plus for those not connected 24/7. I’ve been hearing similar complaints from many of the vanguard on twitter, so I’m not surprised by your insights. I’m going to make a leap and say a big part is because you’re across most of the new and old ideas in education. Being a connected and leading educator, no topic is new to you so of course you want depth to the conversation! A one hour edchat is totally the wrong format if you’re looking for that! The echo chamber thing has me a little confused and it’s a term I’ve seen come up a bit about the #edchats. Can you explain it? There is disagreement. Okay, not a lot. The 140 character limit means when you challenge an argument it’s difficult to not come across as a bit of a prick. Still, people seem to learn after a while to respond to others’ ideas and start side conversations. These might not be deep conversations, but will often lead to finding out about new ideas (links to blog posts and websites), and resources. I’ve seen a lot of new connections made this way that can lead to some very cool collaborations. The RT’ing might seem like high fiving, it sort of is, but it’s also because many ideas come up that are worthy. Teaching can be such an isolated job in many schools, I wouldn’t discourage such shenanigans IRL or online. Allison made some very reasonable comments about promotion of chats and also focus on numbers. That’s a fair call. I just want to put forward that big participation in an edchat can lead to more side conversations (the juicy bits), more varied ideas, greater resources and ideas to find out about, and more people to make further connections with. All good things. Twitter is an amazing place to start. So many voices! So many ideas jumping around! It seems like people eventually graduate from it. They’ll go on to blogging, Google+, LinkedIn (no, scrub that). I don’t know, where else? Some will stick around as well, thankfully. In this way, this network of educators is just like a MMORPG. We both know Google+ isn’t a ghost town. It’s awesome. I hope more voices get on it. It seems like a great middle ground between Twitter and blogging. It’s most blogs that are ghost towns. People don’t seem to comment. As for Teachmeets, I hear you. I went to a great one recently that followed the 7 minute talks with food and networking and then attendance in a 1½ hour workshop of your choice. Variety is cool. More variety would be fantastic, so what other formats have been tried? What could work? I LOVE Twitter. I love how I can dig into it at any time and extract value. I love how it’s like a river of wisdom flowing past 24/7 that i can dip into any time I like. Next PostNext Where’s the Coding?